Raising the stakes further, in an effort to mobilize support among the Hutu majority, the CNDD-FDD has been increasingly employing ethnically polarizing tactics. Purges among senior military and government officials have largely been ethnically based. In November, CNDD-FDD leaders began invoking ethnically incendiary language, recalling the pattern employed in the Rwandan genocide. Emblematic of this was a speech Burundian Senate President Révérien Ndikuriyo gave to supporters in Kirundi on November 3: “… on this issue, you have to pulverize, you have to exterminate—these people are only good for dying. I give you this order, go!” Similar statements were made by other senior government leaders including Pierre Nkurunziza. These remarks triggered a new surge of refugees toward Burundi’s borders. In short, the foundation for genocide—the mindset, climate of fear, and polarization—has been laid. Some Burundians have said the level of apprehension is now worse than during the civil war. Then, most of the killing was between armed combatants. Now civilians are also being targeted, causing a greater sense of vulnerability. Finding a resolution in Burundi has broader implications than for the country itself. Already the Burundi crisis has placed a burden on its neighbors with 223,000 refugees—mostly in Rwanda and Tanzania. 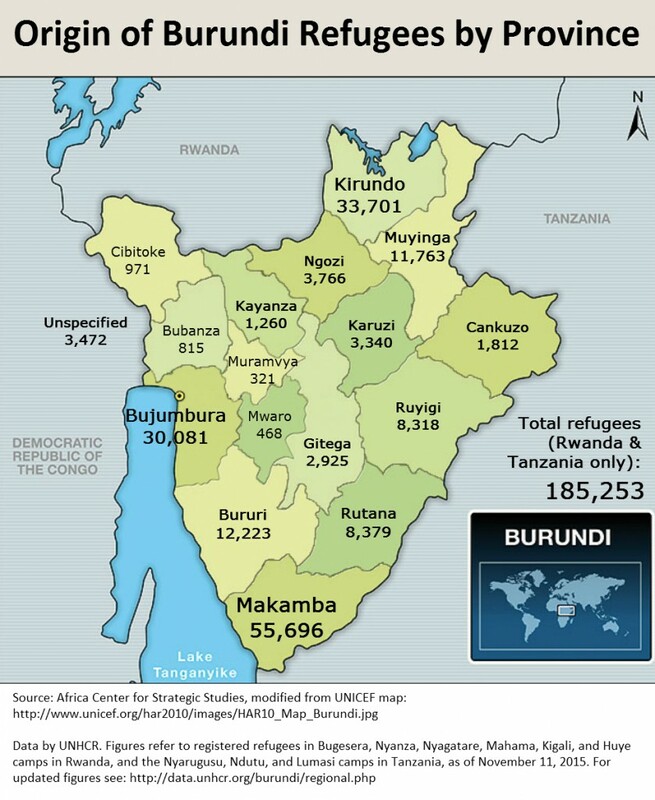 During the 1993–2005 civil war there were 870,000 Burundian refugees, exacting a prolonged economic burden on the region. The outcome of the term limits battle in Burundi also has political implications for the rest of Africa. Since 2000, a dozen African leaders have tried to circumvent term limits that were instituted to limit the monopolization of power and foster a culture of democratic transitions in Africa. Half of those leaders were successful in extending their time in office. The other half, facing concerted domestic and international opposition, were not. In fact, the trend since 2010 has been to block such attempted circumventions. The outcome in Burundi, therefore, will shape the norm on the continent where 19 of 54 African leaders have been in power for more than a decade (and four for more than 30 years). Furthermore, the tactics used in pursuing a third term in Burundi—overriding the constitution, bullying opponents, and then holding rump elections—are a particularly dangerous precedent for Africa if allowed to stand. 1. Support creation of a multi-party transitional government in Burundi. 2. All parties in Burundi must renew their commitment to the Arusha Peace and Reconciliation Agreement. 3. Support deployment of international peacekeeping force. 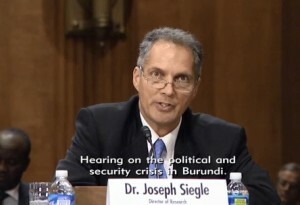 In order to support a political resolution and foster a stable transition to the Burundi crisis, the United States should logistically and financially support an international peacekeeping force (likely comprising 3,000–5,000 troops) under the auspices of the African Union and United Nations. As at the end of the civil war, such a force would serve as a buffer between rival armed groups to minimize the risk of escalation, enhance civilian protection, as well as to serve as a deterrent to provocations that could trigger mass atrocities. Deploying a peacekeeping force would also serve as a confidence-building measure for all sides, which would help provide assurances to those in exile and among all parties to the conflict that their return and participation in the political dialogue will be supported by institutional safeguards. The African Union has previously called on its members to be prepared to support such a mission. UN Security Council Resolution 2248, furthermore, reminds all of the ICC’s jurisdiction and welcomes the deployment of African Union monitors and military experts. The United States should be prepared to expand the scope and breadth of these targeted sanctions as a means of exerting greater pressure on Burundi’s political actors to restore the Arusha Accords and demonstrate a sustained United States commitment to a political resolution. With this aim in mind, the United States should offer its cooperation in evidence-gathering to any International Criminal Court investigation that is undertaken. 6. The free and independent flow of information should be restored. Africa Center for Strategic Studies, “Burundi: A Critical Juncture,” November 8, 2015. Paul Nantulya, “Burundi: Why the Arusha Accords are Central,” August 5, 2015. Africa Center for Strategic Studies, “Burundi: The Crisis Continues,” May 26, 2015. Nicole Ball, “Lessons from Burundi’s Security Sector Reform Process,” Africa Security Brief No. 29, November 30, 2014.